Specialty racks are just that, special. They are racks for unique and/or specific storage and handling applications. Two common configurations in this family of storage product are boat racks and carpet racks. Specialty racks are a strength of ours. We have designed and implemented many racks for unique applications. Two additional fairly standard configurations and designs which are widely used are pull out shelf racks and over dock storage racks. 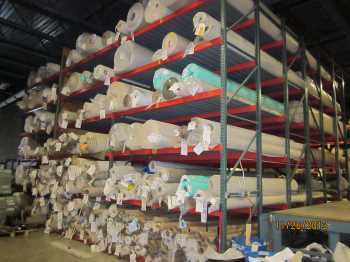 When it comes to Specialty Rack, CSI is your logical choice in Chicago, Illinois, and the Mid-West states. EGA Products, Speedrack, and Steel King are exceptional Specialty Rack Manufacturers. Specialty Rack requires engineering. Specialty Rack is designed to the product and the application. CSI provides specialty racks for those clients who have truly unique applications, such as boat racks and carpet racks. CSI has the expertise and experience to assist in the design of specialty racks of all types. IF YOU DO NOT SEE SPECIFICALLY WHAT YOU ARE LOOKING FOR, Contact us. We can offer a wide variety of options which would all be unique to the application. If it is determined that portable rack will not assist in achieving your objective we have many forms of pallet storage for many different objectives and environments: Selective Racks, Portable Racks, Cantilever Racks, and more.